Age 78, passed away Sunday August 19, 2018 at her home. Survived by her two sons Joseph (Julie) Kirkeeng; and Dennis (Peggy) Kirkeeng Jr.; five grandchildren Anthony (Tabetha) Kirkeeng, Lauren (Terry) Carter, Alex Kirkeeng, Evan Kirkeeng and Jenna Kirkeeng; three great grandchildren Aubree, Aiden and Killian; two sisters-in-law Sandy and Nikki Eyman. Numerous nieces and nephews also survive. Preceded in death by her husband Dennis Kirkeeng Sr.; parents Arthur Sr. and Blanche (Gray) Eyman; four brothers Arthur Eyman Jr., James Eyman, Richard Eyman Sr. and John Stoos; one sister Patrice “Patty” Paluga. Lifelong Joliet resident, recently of Channahon. Judy retired after more than 20 years as a cafeteria worker Laraway School. She was a long-time member of the Messiah Lutheran Church. Passionate about her exercise classes, Judy enjoyed seeing the children at the Galowich YMCA where she was lovingly referred to as Grandma Judy. 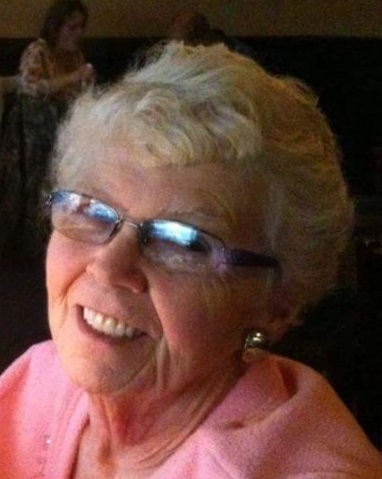 Judy loved big hugs and will be remembered by all for her perpetual smile. A Memorial Service will be held, Saturday August 25, 2018 at 10:00 a.m. at the Messiah Lutheran Church. Inurnment at Woodlawn Memorial Park. A Memorial Visitation will be held Friday 3-8 p.m. at the Blackburn-Giegerich-Sonntag Funeral Home. In lieu of flowers memorial to the Messiah Lutheran Church or Galowich YMCA.